For weeks I’ve been waiting for these flowers to bloom. Ever since I read about making flower flavored vinegars. 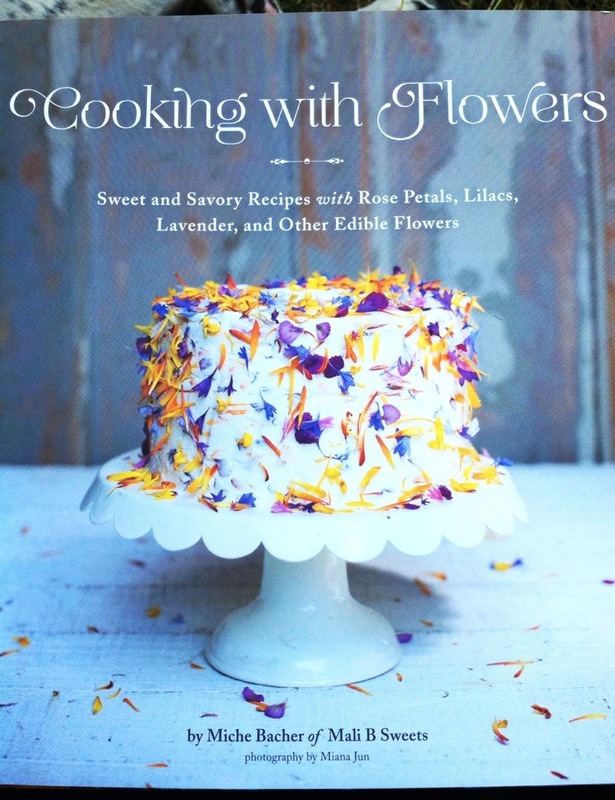 When Quirk Books sent me a new cookbook called Cooking with Flowers by Miche Bacher I was excited to try cooking with these new flavors I’ve never experienced before. Hollyhock Scones, Dandelion Wine, Daylily Cheesecake, Calendula Cornbread, Tulip Martinis, Violet Macarons and so much more. They all sound wonderful. I sent the recipe for Pistachio Rose Shortbread off to my sister for her Alice and Wonderland themed bridal shower. It’s perfect for a tea party. At first, I was concerned I wouldn’t have access to most of these flowers, but after a few minutes, I realized the rosemary and thyme in the front yard are blooming. So are the lilacs next door. My sage plant is about to bloom too. The roses are in bloom. OMG, there are edible flowers EVERYWERE! The rest of the flowers in this book are found in every nursery in any town. We will talk more about this book, I am sure. For now, I am going to leave you with the recipe for chive blossom vinegar from Cooking with Flowers. Put blossoms in a canning jar or another jar with a tight-fitting lid. Warm the vinegar in a saucepan over low heat for 4 to 5 min. Pour it over the flowers. Cap the jar and leave it where it can capture sunlight for 1 week. Move it to a cool dry place or the refrigerator, and let it sit for 1 week more. 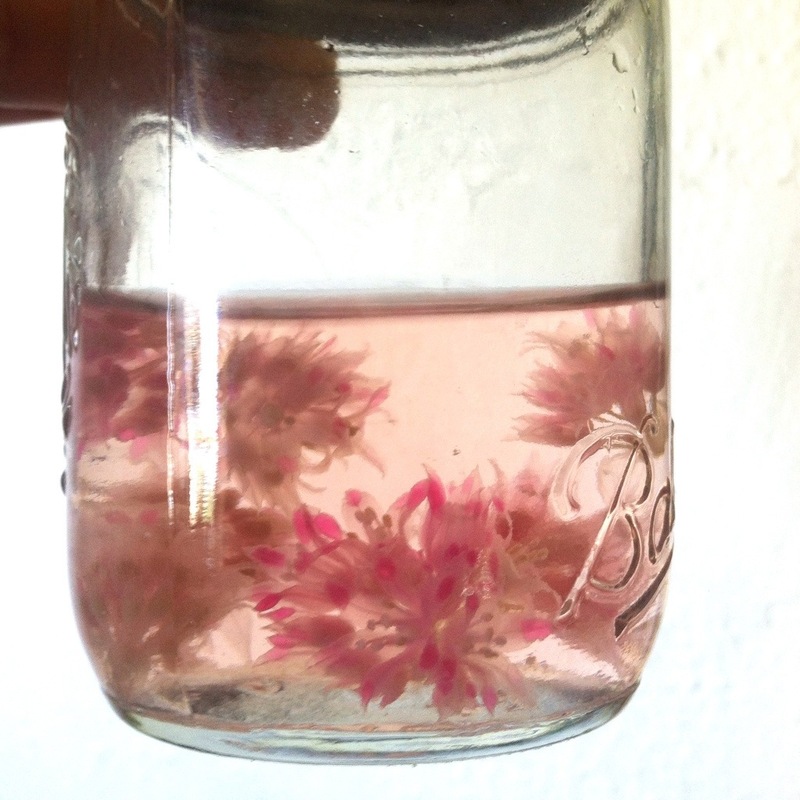 Strain out the blossoms, and store flower vinegar in a clean, capped jar in the fridge. The vinegar turned a lovely pink purple color overnight. I didn’t have 2 cups of chive blossoms so I am using about 1/2 cup of vinegar and all the blossoms I can, adding more as they bloom. *I am aware I missed posting on Saturday, but I think that on the weekends there is just too much going on for me to post. I will if I can but no promises. I have a HUGE chive patch – not flowering yet, but it will – I can’t wait to do this (and I might just put that book on my amazing wish list, after all, I have tulips, dandelions, hollyhocks – ooh this is exciting! How gorgeous is that! My husband adores anything in the onion family; this would be a big hit.